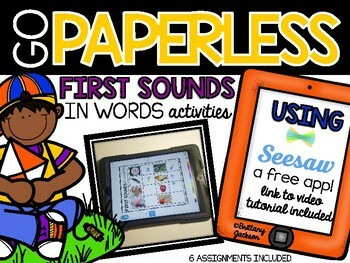 Go Paperless in your classroom using these First Sounds in Words activities via the application Seesaw. Implementing technology in the classroom is crucial to teaching our 21st century learners. Seesaw saves you time on organization and parent communication, makes formative assessment easy, and provides a safe place to teach 21st Century skills. This resources includes 6 various assignments. This product is for those who are familiar with the application and are looking to save time printing and preparing activities and instead use technology. Though I know that this idea of providing activities for students to use within the application may seem direct, but this is the purpose of this right? I have done the work for you and provided you with an easy to follow video tutorial on how to do so. Great resource for informal assessments! Keep in mind you will need internet access. 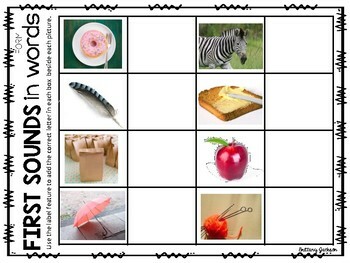 Your devices will also need a “class” set up in the application Seesaw before students can engage in this activity (link is provided in download if needed).